Librarian- Passed PG Degree in Library Science with minimum 55% Marks and National Eligibility Test(NET) Qualified. OMSP(Instructor)- Passed Graduation and DIploma in English Shorthand and 10 Year Work Experience as English Stenographer. Section Officer- Passed Graduation with minimum 50% Marks and 6 Month Computer Course with 6 Year Work Experience. Senior Assistant- Passed Graduation with minimum 50% Marks and 6 Month Computer Course with 4 Year Work Experience. Technical Assistant- Passed Graduation with 2 Year Work Experience or Passed Post Graduation Degree. Semi Professional Asst- Passed Graduation with 50% Marks and B.Lib with 50% Marks and 6 Month Computer Course. Library Assistant- Passed Intermediate Exam and Certificate in Library Science and Computer Application. Assistant- Passed Graduation and 6 Month Diploma in Computer Application/Office Mgmt and 2 Year Work Experience. Jr. Assistant- Passed 12th with 50% Marks or Graduation in Concerned Discipline and 40 wpm English Typing and 30 wpm Hindi Typing Speed on Computer. MTS- Passed Matric Exam and Certificate in Library Science/Computers. 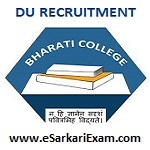 Eligible Candidates can Submit Application at the Official Website of Bharati College Latest by 15th March 2019. Applicants First Open Bharati College Official Website. Open Vacancy Link in Important Link Section. Open Non Teaching Staff Recruitment Advt. No. BC/NT/2019/ 1575 Advertisement Link. Now Click on Online Link for form Non Teaching Post. Click on New Form Registration Link. PWD Candidates Can Submit Application by Post. Take Printout of Application Form and Send it Along With Required Documents in A Sealed Envelope. Envelope Superscribed with “Application for the Post of ___________ (write the name of the post) and Registration No. __________ (as generated on the online application form)”. Application Should Reach Latest by 15th March 2019. Read Official Notification Before Apply.